The Horror Movie BBQ: Essential nWo Merchandise! Well ya know something, nWo-ites, it's nWo week here on the Horror Movie BBQ. Oh yeah, brother! Hollywood Chad comin' atcha with that black and white attack! In fact, that banner is looking a little old school, man. I think it's time for a new attitude! That's more like it! 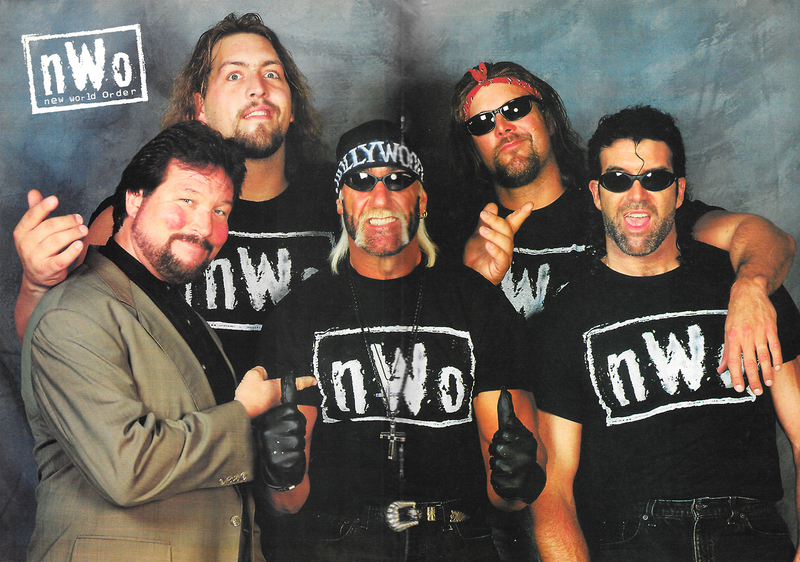 Now that we know that this is the place to be for nWo related content, brah, it's time to take over!!! What's that? 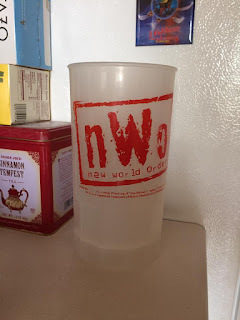 You want to know what the best and baddest merch to own if you're a true nWo-ite? Well, I got your back! 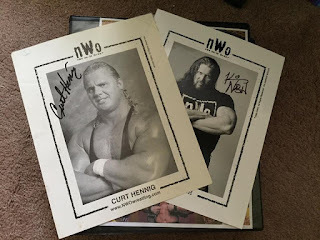 Let's take a trip down nWo memorabilia greatness and see what you should pull those dollar bills out for! On a hot day out at the pool or just hanging around the house, you gotta keep your can cool, brah. 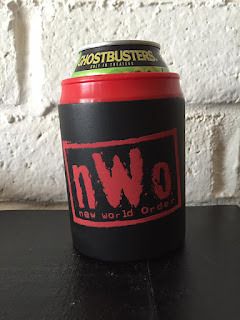 And what's cooler than an nWo can coozie? Nothing. Chalk up one more for the bad guys! WWE Network has a lot of great nWo content. From every episode of WCW Nitro, nWo Souled Out, WWE Legends Roundtable, even the new Monday Night Wars featuring a lot of nWo discussion. 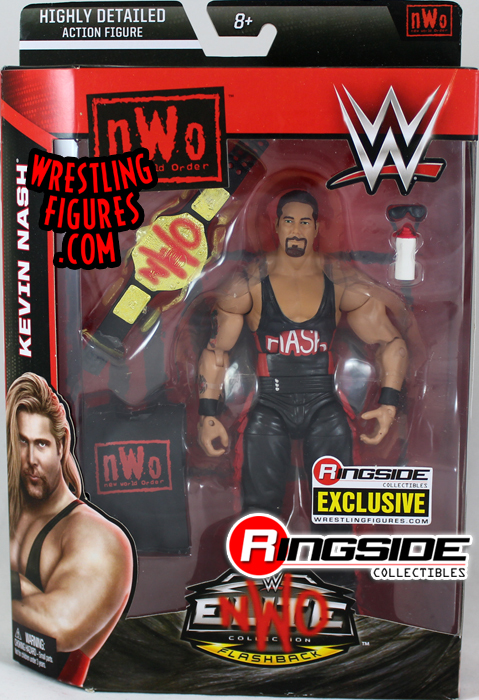 But before that, WWE realized cash in the nWo name. 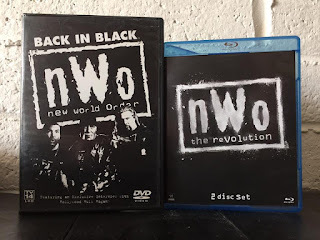 In 2002 our friends at Stamford put out a dvd featuring a brief nWo documentary and mini match compilation from the beginning of the group in WCW in 1996 to their end of the group in WWE in 2002. Admittedly, it's not the strongest release, since WWE didn't put a lot of effort into their documentary releases at time, but it's still a must own. It's a nice insight into what those involved experienced, but us nWo diehards wanted more. 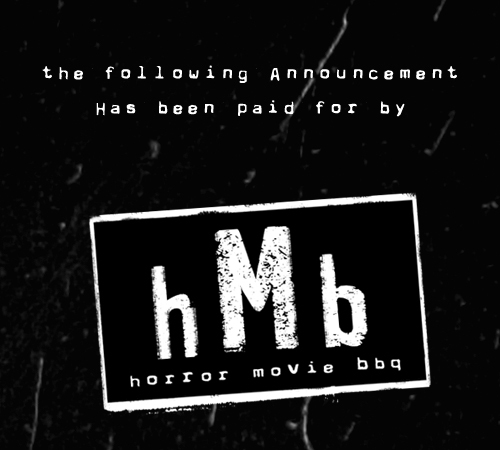 And in 2012, we got more! 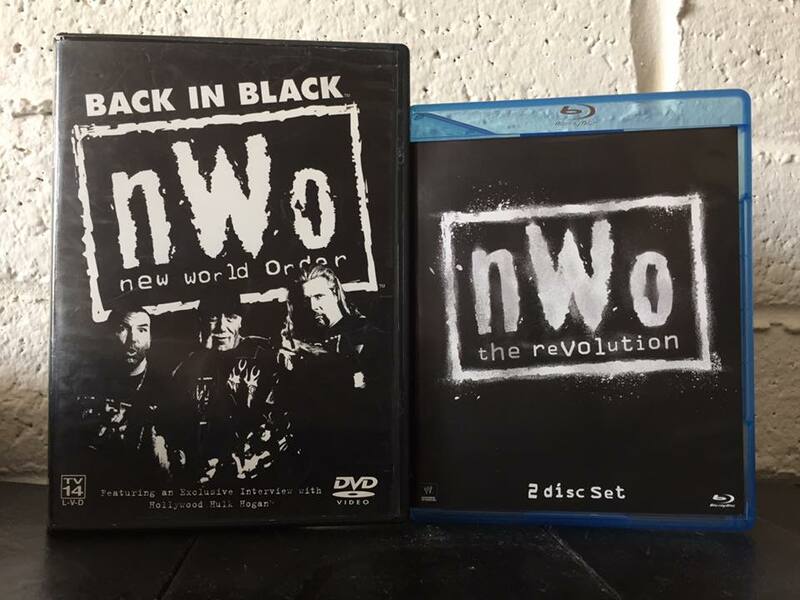 nWo: The Revolution was released with even MORE extras! A a more in depth documentary, promos, matches, the aforementioned Legends of Wrestling: nWo episode and more! A great value for the black and white loyalists. Looking to show off to your coworkers and friends? What better way than to show them your authentic nWo signed merch? I've been given the honor of meeting the crew themselves and got a lot of cool stuff signed but these two may be two of my favorites. 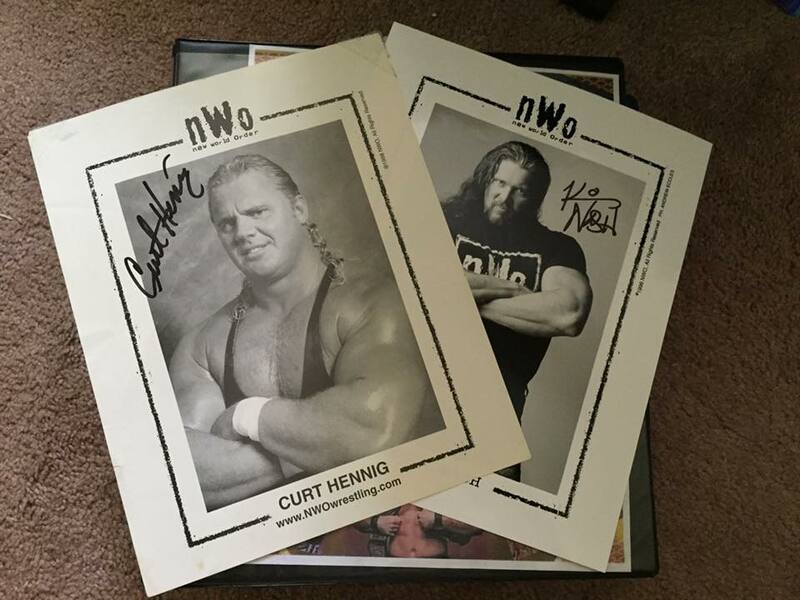 Nash and Curt Hennig signed photos! 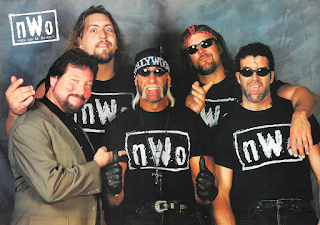 And not just any promo photos, but nWo branded photos! Awwww yeah! You can't get much more sweet than this! Funko Pop's are hot, right now. The exclusives are always quick to sell out and hit eBay in record timing. A lot of people are comparing them to the modern Beanie Babies, but one has to admit, they're pretty fun to collect. So WWE, knowing what's hot and can get them some extra dough, had to get in the game with their number 1 stars. Of course, while the current brand of WWE Superstars are absolutely incredible, the big wigs at Stamford knew that a certain group would also bring in some sweet cash. Hollywood Hogan was offered as an exclusive to the WWE Shop in a Hulkamania preorder package for their hit WWE 2K video game series. I didn't order one, but thankfully a friend did and had no use for this figure. Glad I got it from him, because one look at eBay shows it's sold between 45 to 90 dollars. Wolfpac Sting was offered as a Gamestop exclusive this past year. I gotta say, I'm a huge fan of Sting and while a black and white "Crow" Sting would've been welcomed, I can't turn down anything nWo. 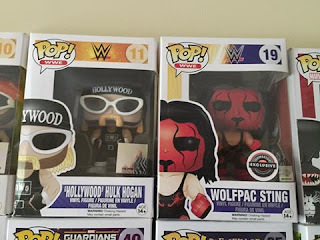 Plus, I loved the Wolfpac. It was different than the black and white plus a red and black facepainted Sting? Just so cool! 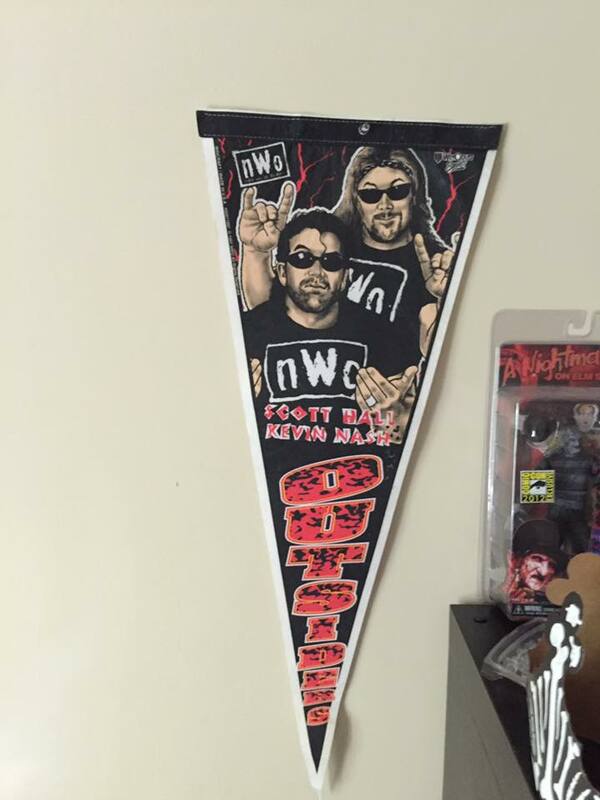 Transform that boring wall of yours into something just two sweet with an nWo pennant! Many of the nWo members got pennants but my favorite is by far the Outsiders! Beats those boring posters of those chumps from WCW! Quite frankly, if you don't buy anything else on this list, BUY THIS. The shirt is downright iconic. You can't be a fan without owning one. From 1996 to now, I've had at least a dozen of these, whether it was an official WCW or WWE. Heck, in middle school, my friends and I actually MADE our own shirts! I mean, they were nothing more than sharpie on a gray shirt but we HAD to wear them until we got our own legit shirts. And once we did, we were a part of the group that was the talk of the town. And to this day, if I wear this shirt, I still get compliments. In fact, last Sunday I wore this when I hit the local flea market and got multiple "nice shirt" comments. Proof that 20 years later, this shirt is just...Too...SWEEEEET! And yes, those are official nWo sweatpants. No cooler way of lounging around the house than to wear this combination. So there you have it, my fellow nWo-ites! 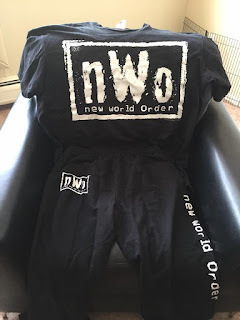 Must own merch featuring the bad boys of the nWo! Check eBay or even flea markets for these! You can stills core some sweet stuff from WWEshop including reprinted shirts, mugs and coozies, and even the big belt itself! Feed your need for everything nWo, brothers and sisters! Wear that black and white (or black and red) proudly!!! Awesome! Can't wait to see what else you have in store!